Francis Orval, internationally renowned soloist and recording artist, was Professor for Hom at the Musikhochschule in Trossingen, Germany. Bom in Liège, Belgium, he became an American citizen in 1986. Francis Orval has had 20 years’ experience as principal hom with major orchestras in Belgium and Luxembourg, and in 1983 he went to America where he held professorships at several universities. During his first European period, Francis Orval served as professor at the music conservatoriés in Liège and Luxembourg. Other administrative positions have included: co-director of the Grêtty Music Academy in Liège, Artistic Music Director for the “Académie Internationale d’Eté de Wallonie”, and founder/organizer of two International Hom Competitions in 1977 and 1981. 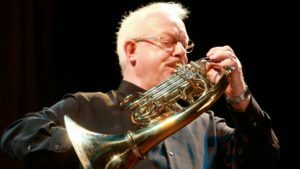 He served as adjudicator for several competitions and is a member of the International Horn Society’s advisory council. Orval received the First Prize at the Louise D. McMahon International Music Competition, in Lawton, Oklahoma. Among Orval’s numerous recordings are: BrahmsTrio opus 40 with the late A. Grimmiaux, – violin and G. Sebok, piano (Philips), Haydn (Rosetti?) Concerto for two horns (Decca), Belgian Contemporary Music (Polydor- Deutsche Grammophon), Schumann’s Konzertstück, Saint-Saëns’ Morceau de Concert, Weber’s Concertino, etc. (VOX/ Turnabout) and the Mozart Hom Concerti (CD Marcophon). On natural hom, he has recorded the Berwald and Beethoven septets with the Uppsala Chamber Soloists (Sweden) and several works with “La Petite Bande” directed by Sigiswald Kuijken (Belgium).